Lanzarote Golf is situated in the main tourist centre of Puerto del Carmen just 5 minutes from the best hotels and beaches on Lanzarote and 10 minutes from the airport. A modern 18-hole golf course par 72, it was created by the well-known American designer Ron Kirby who adapted the original land, with its attractive undulations in keeping with the idyllic landscape of Lanzarote. (Kirby – “I want the course to be fun and enjoyable for all players but never regarded as easy”). It is an 18-hole, par 72 course with four par 3’s, four par 5’s and ten par 4’s, with a total of 6.133 m. length. No matter what handicap you have, the golf course is challenging at all levels and with a perfect all-year-round climate, you will have a truly enjoyable experience. Open all year round in a great climate. Club hire, trolleys, buggies, driving range, putting green, pro-shop and club storage. Club house, men's and ladies' changing rooms, locker hire, bar and café-restaurant. club professionals and clubmaker. Golf Academy. Lanzarote Golf currently has an Automatic External Defibrillator (AED) in its facilities. Staff members from different departments of the golf course have been trained in DESA, CPR and first aid for the correct use of it in case of emergency situation. 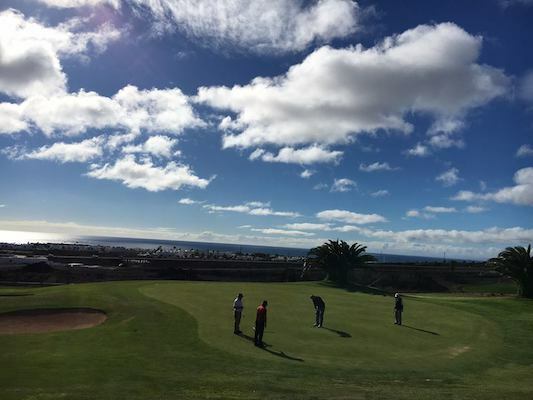 Lanzarote Golf is situated between Puerto del Carmen and Tias, 5 minutes from the main hotels and beaches of Puerto del Carmen, and 10 minutes from the airport. Thanks to the extraordinary climate enjoyed on the Canaries, it is possible to play golf all year round in spring-like temperatures. The average annual temperature is around 24º Centigrade.